It’s said of Vienna’s cafés that you consume time and space, but only coffee appears on the bill. These are places to think and contemplate, to sit and read, to discuss the weighty matters of the day over a cup of coffee and a slice of cake. The waiter will not hurry you, will not bring the bill until you ask for it. Sit here all afternoon, among the shabby, romantic grandeur, next to the billiard table, surrounded by the world’s newspapers and nobody will notice. Dream, discuss, write, plot, conspire, just as Freud, Mozart, Stalin, Klimt, Wittgenstein, Schubert and the rest did before you, many in the same cafés, in the same booths, eating the same food and drinking the same coffee. There’s a very real sense in Vienna that the course of world history, particularly in the twentieth century, pivoted around those streets. I feel this in Berlin, too, where a glance downwards catches a brass plaque bearing the names of Jewish people who used to live at that address, sent to their deaths at the hands of the Nazis. In Vienna, the same thing happens, a scene feels familiar, too familiar, and a quick Google reveals that you’re standing under the balcony from which Hitler addressed 200,000 people in 1938, a time when things fell apart. There’s an eternal quality to Vienna. It’s seen horror and bloodshed, but it’s also shaped some of the world’s greatest thinkers and artists, a creative catalyst fueled by the murky grey waters of the Danube, and fermented in those wonderful cafés. We sat down at a little side table in Café Sperl, a little away from the pianist. There was a man punching away at a Macbook, and another reading a paper, it’s spine trapped in a long wooden pole to aid maneuverability and to stop it being stolen. Others daydreamed and gossiped, waiters and waitresses, moving invisibly around the place as if in a ballet, such was the precision of their movements, guided by the unconscious knowledge they’d gained of this space from months and years of serving coffee and food to its tables. I ordered coffee, and apple strudel. The waitress apologised, and said that there was no strudel left, but we could wait twenty minutes or so for some more to be made. We didn’t mind, mainly because we were in a place that invited the quiet, relaxed killing of twenty minutes or so more than any other I’ve ever been in. Some time passed – it might have been twenty minutes, it might have been longer, I don’t care – and eventually, my strudel arrived, hot and steaming, dusted with icing sugar that was slowly caramelising under the heat of the filo pastry. The pastry shattered at the touch of a fork and revealed rich, tender apple underneath, sliced thin and cooked to leave a little bite and substance. It was delicious. I’ve wondered since whether the combination of the history, the atmosphere, and my happiness at that particular point added to the quality of that apple strudel, and I’ve concluded that it didn’t, that that strudel was simply one of the finest things I’ve ever eaten. A perfect thing. Of course, I’ve tried to recreate that experience, and my version, adapted from one of Rick Stein’s recipes, doesn’t come close, but it is a superb dessert and well worth attempting. 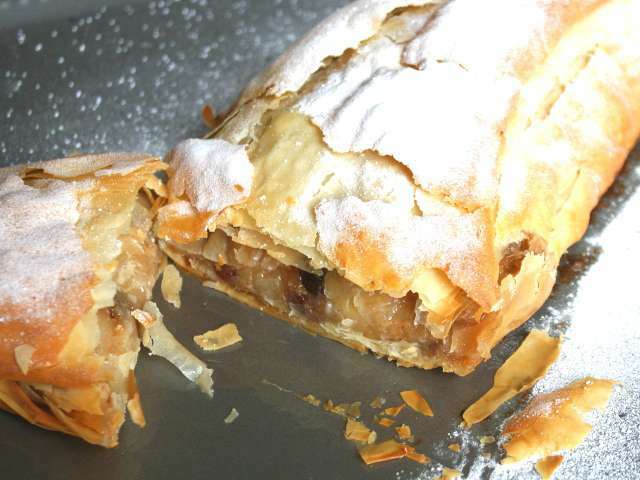 The key ingredients of any apple strudel are apples and filo pastry, so it’s worth seeking out the best of both. Luckily, frozen, or ready-prepared filo pastry is an extremely good product, and it’s a good idea to have a pack or two stashed in the freezer should the need arise. Making filo pastry at home is, I’m told, possible, but it’s technically complicated and, quite frankly, out of my reach. Six sheets of filo pastry is enough for one fairly large strudel … start by peeling one sheet from the pack and laying it flat on a large work surface, on a clean tea towel. The tea towel will help to roll the strudel up at the end, making it easier to handle. Melt about 75g of butter in a small pan, and brush the pastry all over with the melted butter. Lay another sheet of pastry so that it overlaps the first lengthways by about a quarter, brush again, and then move back to the top and lay yet more pastry out so that it covers the first piece. Continue in this way, brushing each sheet of pastry with butter, until all six sheets are used up. Now for the apples. Peel and core three medium sized Bramley apples, around 750g, and cut each into quarters, then slice across into slices about as thick as a pound coin, or two Euro coins, if you want to be authentically Viennese. Put the sliced apple into a large bowl and add a teaspoon and a half of ground cinnamon, 50g of demerara sugar, 50g of caster sugar, the zest and juice of half a lemon, and 75g of raisins, and mix well. Taste a piece of apple. It should be slightly too tart, and a little acidic. It’ll mellow in the oven. Quickly fry 40g of white breadcrumbs in 20g of melted butter in a small frying pan, until the breadcrumbs soak up the butter and start to turn golden and nutty. Lay the apple out along the top edge of the pastry, piled a few centimetres from the edge, and sprinkle the fried breadcrumbs over the top. Using the tea towel to lift the pastry back towards yourself, roll the pastry over the filling until it’s properly encased. Tuck the ends in to seal the strudel, and brush the whole glorious thing with more butter. Transfer the strudel to a baking sheet and bake in a hot oven (190c) for forty to forty- five minutes, until the pastry is hard and brittle and the apple soft, but still holding its shape. Dust well with icing sugar. Some people leave apple strudel to cool to room temperature, others prefer it hot from the oven. Either way, serve with cream or ice cream, custard or nothing.